Certain Agile concepts and ideas have been part of the content marketing conversation for some time now. Scrum is one concept that’s often part of these conversations. But bundling it with Agile causes all kinds of confusion. This article focuses on how a Scrum-based approach to content marketing could work, as told through the experience of a hypothetical content marketing team. The Scrum concept revolves around iterative, incremental delivery. In software development, the Scrum team strives to deliver increments of working software in short, time-boxed iterations called sprints. These sprints have a clearly defined beginning and end (between one and four weeks) and a clearly defined goal. 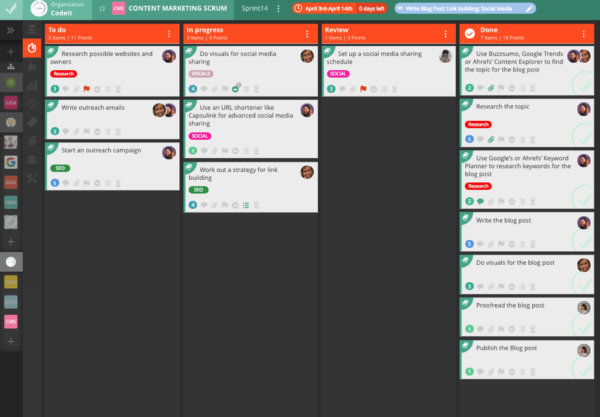 A content marketing Scrum team would operate similarly, with a set sprint length (which should remain the same for all sprints to make track efficacy easier) and a defined goal or goals. The content team collaborates to reach that goal within the designated time frame. 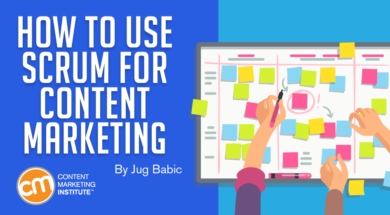 It may seem counterintuitive to adopt the Scrum approach for something like content marketing, which is an ongoing effort. In practice, however, this way of doing content marketing can be quite eye-opening. Example: The content team decides on a two-week sprint. The goal is to write a comprehensive post for the company blog (complete with keyword research, visuals, etc. ), to share the post on social media, to formulate a link-building strategy, and to reach out to third-party sites for the purpose of building links to this article. This iterative approach gives the content marketing team clearly defined increments of work, which can be analyzed and modified quickly without wasting time on something that provides no value to the blog, the company, or the readers. Scrum’s emphasis on empiricism encourages Scrum teams to be fully transparent, to review and analyze their work, and to adapt accordingly. Sprints provide added structure and focus for the team, enabling it to identify and work toward achievable goals. This aspect of Scrum creates an atmosphere of steady accomplishments, which is important because content marketing can feel like an endless endeavor. Finally, executing content marketing in sprints helps teams better understand how much time and effort is needed for certain types of work, so they can improve their planning. HANDPICKED RELATED CONTENT: Do Agile Marketers Wear the Quality Content Crown? A product owner, whose main responsibility is to maximize the value delivered by the Scrum team. The PO maintains the product backlog (I’ll explain that later), clearly defines and orders the product backlog items, and makes sure everyone understands them well enough to work on them. A Scrum master, who acts as a servant-leader for the team. The Scrum master helps everyone understand and practice Scrum through advice, coaching, and making sure the framework is applied properly. The Scrum master is also responsible for removing any impediments (internal and external) that prevent the team from doing its work. A development team, which includes people who deliver a “releasable increment of the product” (more on this later) and which has the final say in what will be done in a sprint. The development team has no hierarchy, titles, or sub-teams. Some teams have product owners and Scrum masters who dedicate their time to their roles. For content marketing Scrum teams, it is more likely the product owner and the Scrum master also will be part of the development team, i.e., doing practical work. Scrum provides a great structure for organizing the work in a way that makes clear who is working on what and why something is being done. The product backlog is a prioritized list of everything needed for the product. For a content marketing team, that product may be successful content pieces that bring in leads and boost conversion rates (or anything else that your team is focusing on). The product backlog includes product backlog items (PBIs), which describe the work the team must do to add value to the product (successful, sustainable content marketing). As I mentioned, all of this is the responsibility of the product owner. The product owner can (and should) consult the rest of the content marketing Scrum team about the product backlog. But, being the sole person responsible for the backlog, the product owner can bring focus and clarity to it. Not all product backlog items are described in great detail. The product owner only goes into details on product backlog items being addressed in the next sprint or two. Also, remember the product backlog is a living thing and can change over time. When it’s time to start a new sprint, the development team pulls the product backlog items needed to reach the sprint goal into the sprint backlog – a list of ordered PBIs to be worked on in that sprint. No one decides on how all of this will be done except for the development team, i.e., the people who will be doing the work. For example, the development team would select the tools and the process to use to find the topic and research keywords. The development team is the one with the final say on what will be done in a sprint. While it’s not a formal concept from the Scrum Guide, most Scrum teams use a Scrum board to visualize the work in a sprint. It can be a physical board with sticky notes or it can be a virtual one for teams that use Scrum software. You can see all the product backlog items have been pulled into the sprint. Some of them are completed, while some are in progress and some still need to be started. This example illustrates how work moves across the Scrum board. As you can see, Scrum enables a clear, transparent, and effective way to organize work, providing data on who did what, where the holdups might be, and how the sprint is progressing. Organizing work this way encourages collaboration among team members to move them toward the sprint goal without wasting time and resources. For example, if the team notices that the PBI “work out a strategy for link building” is stuck too long in the “In Progress” column, additional team members can jump on it and get things rolling again. Scrum meetings are held regularly and help improve the teamwork and the product. The sprint planning meeting happens before a sprint starts. At the planning meeting, the product owner suggests product backlog items that the team should work on and the development team then discusses what to take on and the best way to do the work. Example: The content marketing Scrum team’s product owner suggests that the team should write a blog post, share it on social media, and conduct an extensive link-building campaign for it. The development team points out there is no way to accomplish all of that in a two-week sprint. The team agrees to take on writing the blog post, sharing it on social, and planning the link-building campaign. They then talk about how to do the things necessary to accomplish this set of goals. During brief daily Scrum meetings, the team talks about what they’ve done, how everything is going, and what they plan to do that day. It’s the perfect opportunity for the team to identify possible bottlenecks and impediments and come up with a way to resolve them. Example: In a daily Scrum meeting, the development team member working on the social media sharing strategy has spent time on it, but it isn’t progressing as quickly as necessary. Another team member offers to help to move things along. After the sprint, the Scrum team members meet to review the work accomplished. They talk about what they did well and what could be improved in future sprints. The sprint review is also the chance to showcase the team members’ work for others. It also can be used to elicit feedback from other stakeholders in the company and explain how the work done by the content marketing team will contribute to the company. Example: In the sprint review meeting, content Scrum team members review the blog post and identify ways it could be improved. But they agree that the social media content developed for it went well and the link-building campaign is on solid legs. The sprint retrospective focuses on how the team collaborated as a unit, the obstacles they ran into, and how they can become a more productive and collaborative team. The purpose is not to assign blame but to have a positive meeting that reinforces the feeling of belonging to an ever-improving unit. Example: In the sprint retrospective, the content team realizes that crucial input was missed because one person felt uncomfortable voicing their concerns about another team member’s ideas. The retrospective enables the team to be open about things often swept under the rug and to correct this kind of behavior. The main goals of all these Scrum meetings are to promote transparency around what the team does, to honestly and objectively inspect the team’s work and how it works as a unit, and to adapt the strategy and the practices to ensure that the team delivers as much value as possible. TIP: Check out some Agile tools mostly aimed at Scrum teams to support your team. Though it was once a tech-focused process, Scrum can bring benefits to content marketing teams. But it shouldn’t limit content teams from applying other practices and ideas. That’s the point of Scrum – to provide a framework that will help establish what delivers value and what doesn’t. Scrum usually doesn’t come with instant success. It takes time for teams to find the best way to work under the framework within their company. Some teams might emphasize certain practices and avoid others that make little sense for their situation (i.e., assigning value to individual tasks). But the key benefits of Scrum – transparency, inspection, and adaptation – lead to better ways of doing things. Learn more about marrying technology and content to make your content marketing programs more effective at ContentTECH in April in San Diego. Register today and use the code BLOG100 to save $100. Jug works at VivifyScrum as a marketer, part of a Scrum marketing team that handles content marketing and more. He has spent the better part of the decade in content marketing - as a freelancer, at an agency and in-house. Follow him on Twitter @BabicJug.